The default timezone is US Eastern Time. We allow you to set timezones in several places. 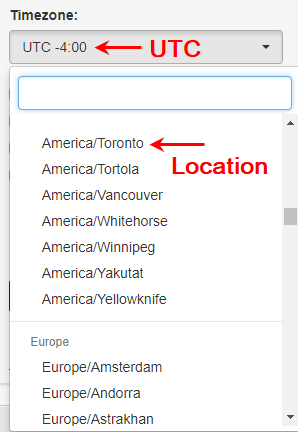 The account timezone is a global setting that will be overridden if you set a timezone filter on the Scans and/or Tasks page. The option to override is for clients who perform services globally or have app users in many timezones and therefore need scan records to reflect the appropriate timezone. UTC: This is sometimes chosen by developers who do their own offsets. Location: This is the recommended option because it will automatically adjust for Standard Time, Daylight Savings, etc.